Sundance kicks off in less than 48 hours and below I have two of the horror films that are being showcased, (out of competition) at the annual event held in Utah. The films are incoporated into the "Park City at Midnight" category, which generally houses films ranging from outstanding horror films, hilarious comedies and mind bending animated films. As the name notates, Park City at Midnight is the last stop of the night, for screenings and the films of course are screened at midnight! If you live anywhere near Utah and want to catch some amazing films, tickets are still available for a majority of the films screening in the 10 day event. Both films are in the horror genre and both look to take unique perspective on zombie films. 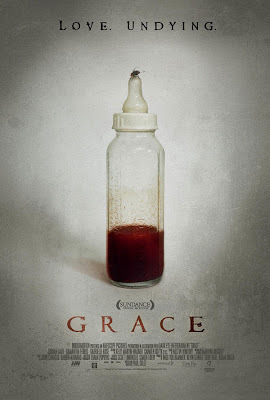 First up, "Grace" which screenings Friday the 16th. Written and directed by Paul Solet, "Grace" is an 85 minutes film that follows an 8 month pregnant mother, who after a tragic accident finds her baby has died inside of her. The mother however, remains insistent to carry the baby to full term and after birthing a lifeless baby, she finds the baby is alive. Soon there later the mother notices that something is terribly wrong with her newborn and its craving for food. No theatrical release date has been set yet, but with its screening upcoming at Sundance, it is sure to find itself in theaters in at least a limited run this year. Secondly is "Dead Snow"! 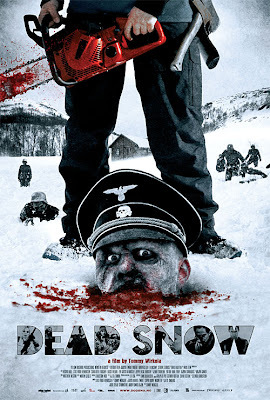 "Dead Snow" directed by Tommy Wirkola comes in the same vein as Shaun of the Dead with a hilarious look at the zombie genre, with a twist, Nazi Zombies! Yeah, I know, just saying Nazi Zombies sold you right? "Dead Snow" looks like a riot and the newest one-sheet for the film is stellar. "Dead Snow" opened in Norway on January 9th and screens Saturday the 17th at Sundance, so like "Grace," "Dead Snow" should be finding at least a limited run sometime this year. Cross your fingers! !